Pascale Gomes-McNabb is a talented designer who excels with every project. Primarily known for her hospitality projects such as The Stokehouse, Penfolds Magill Estate Restaurant, Bentley Restaurant and Bar, Monopole, Yellow, Cirrus (to name but a few) and lately Jackalope, working with Carr Design and Fabio Ongarato Design, her talent and expertise is much sought after. Reflecting its owner, Gomes-McNabb’s home is beautiful and eclectic, as inside co-editor Jan Henderson discovers. inside: How long have you lived here and what drew you to the property? Pascale Gomes-McNabb: We have lived here for 12 years; in 2016 we renovated the property. I love the location of the house, its proximity to the city. The area is semi industrial… and quiet. When did you produce this design? The design of course has been gestating for so long… since the purchase of the property and has had many incarnations as needs and situations arise and change; i.e. a child growing into a teenager! However, the basic idea and essential functional and pragmatic requirements have remained the same over the several hundred designs I have drawn from the purely minimalist delusions (I have a lot of ‘stuff’) to more crazy maximalist fantasies. 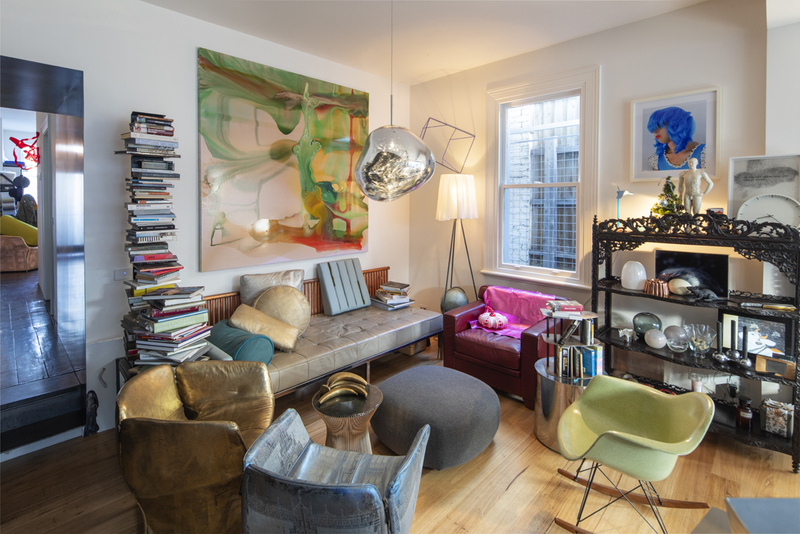 I am very happy with where it is now; however, I do believe it takes a while to settle into a house or new space and make it feel just right – that is, the right mix of calm and crazy, creative, curated! I had never intended to work here, but the idea and necessity grew quite organically akin to my design practice. It is a family home and the design brief I set was always for that. 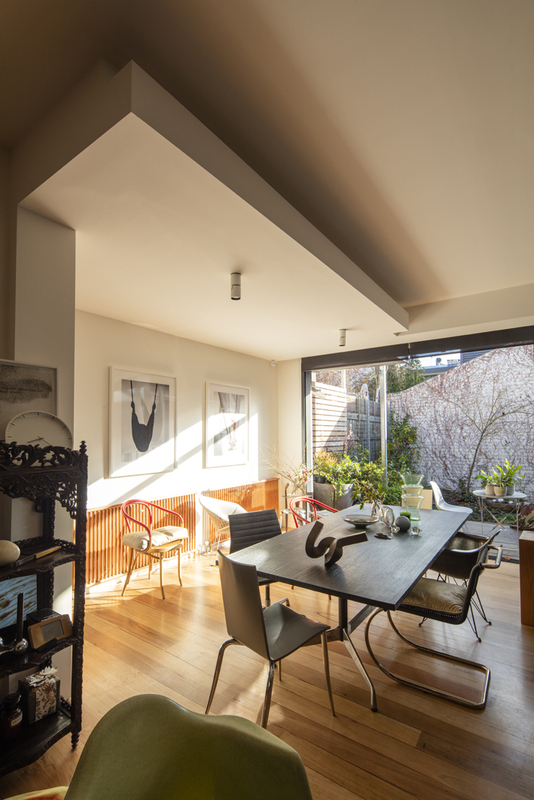 There’s a large kitchen and family area to congregate in – which works well whether there are just two of us, me in the kitchen or 40 people in that space. The bedrooms have always been just that, but there are other spaces that, as needs change, so can they – there is flexibility to the layout. And I have put in a provision to enable the house to be split/subdivided into a one-bedroom unit and a three-bedroom home. Who knows? I would say I am quite demanding and exacting and I always want a great result. Or why bother doing it at all? If I am not happy or think there may be a better solution or outcome I will search for it until I am completely satisfied with the end result. Which is your favourite room and what makes it special? I love the kitchen… for its complete practicality; i.e. for the way I like to entertain and cook and live and use the house. And my bathroom – when I lie in the bath (when it is full with water and me) I can look up at the sky and watch the clouds passing or the stars at night. Blissful. There are several ‘moments’ in the house where I like to just stop and sit and appreciate the effort that it has taken to get here. I enjoy sitting on the stairs, which are now bare and show the historical journey that has occurred in the house, the layers of paint and where carpet and whatever else that has been imprinted on them has gone. Or just lying on a beanbag on the upstairs terrace watching the sunset. 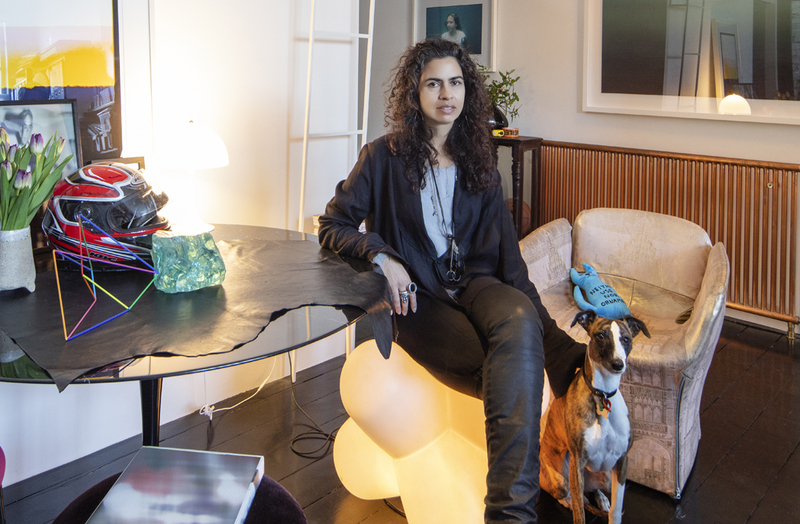 Tell us a bit about working with your art collection? I am not sure I would call it an art collection per se (as I do know some extreme art collectors); however, the art I have are pieces I have acquired over the years and enjoy living with. From a young age, I have been interested in art, design and the visual expression and artistic output of others from craft to purely conceptual pieces. I have been involved in and created various art projects over the years. The house is filled with objects and interesting mementoes whether ‘serious’ visual art or just beautiful and intriguing found pieces. It is important to surround yourself and home with beautiful things that you love. I also consult on art for clients. I like to create total environments from the basic planning all the way to the artwork and what goes where. I believe interior design is a process of curating and curation. Which is your favourite piece of furniture and why? I don’t have a favourite piece of furniture – many of the pieces I have in the house are prototypes from my varied projects. I have side tables and glass balls from Penfolds, chairs that Spacecraft and I collaborated on, timber stools that I designed for Cumulus, that Arteveneta have redone for me – mixed in with other old, new, found, bought pieces I have found here and/or lugged from overseas. I love them all! 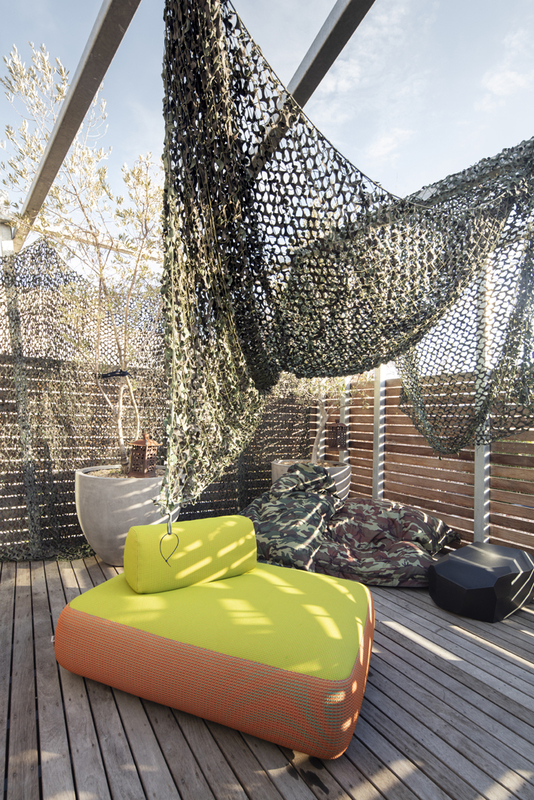 The Paola Lenti outdoor ottoman on the upstairs terrace is gorgeous. Does being in the design industry, where you’re constantly looking at new design, make it difficult to choose products for your own home? Constantly looking at new pieces can make the decorative side of the industry feel quite superficial and unsustainable and a lot of it is; however, there are always quite exceptional and or extraordinary pieces that rise above the average. So for home I have an eclectic mix of found, old or newish things collected along the way. I don’t have a grand plan for the way the house is furnished; it is rather a journey. Are there any loose elements that you change frequently and, if so, what are they? I have a large collection of ‘stuff’ (furniture, objects, lights, art, ephemera etc) that I constantly rotate, including the many prototypes of furniture, objects and lights I have had made for projects and myself. My approach is that once you have laid down very well thought through functional plans – the final layers of furniture and the decorative parts of design can be continually enhanced and changed and updated and more layers added or deleted. I enjoy moving the artwork and other elements around, curating scenes. It is fun! This article originally appeared in inside 103 – available online and digitally through Zinio.